Whether your goats are backyard pets or you're raising them for milk or meat, vaccinations and deworming keep your animals healthy. Ask your veterinarian to recommend the appropriate vaccinations and their timetable based on your particular region and your herd's needs. Your vet can also recommend dewormers, many of which must be used off-label with veterinary permission. Clostridium C and D with tetanus, often referred to as CDT, is the core vaccine for goats. Given subcutaneously, kids receive their first injection at the age of 3 months, with a booster shot a month later. After that, it's an annual vaccination. CDT protects your goat against overeating disease, technically known as enterotoxemia. This occurs when the bacteria clostridium perfringens produces toxins in the gastrointestinal tract. Tetanus, also called lockjaw, results when clostridium tetani gets into your goat's body through punctures or other wounds. You might want to vaccinate your goats for rabies, especially if the disease is common in your area. If you have dogs, cats or horses, you already make sure they're up-to-date on their rabies vaccinations. The difference with goats is that the vaccine isn't approved for them. However, some vets recommend an annual vaccination because it can offer the animal -- and you -- some protection against this deadly disease if they are bitten by a rabid animal. If you show your goats or often transport them, consider adding the abscess vaccine to your CDT routine. Few dewormers are manufactured specifically for goats. Instead, you must use dewormers sold for sheep, cattle or horses, adjusting the dosage as necessary. Always ask your veterinarian about the appropriate dosage of a particular dewormer for your goat. 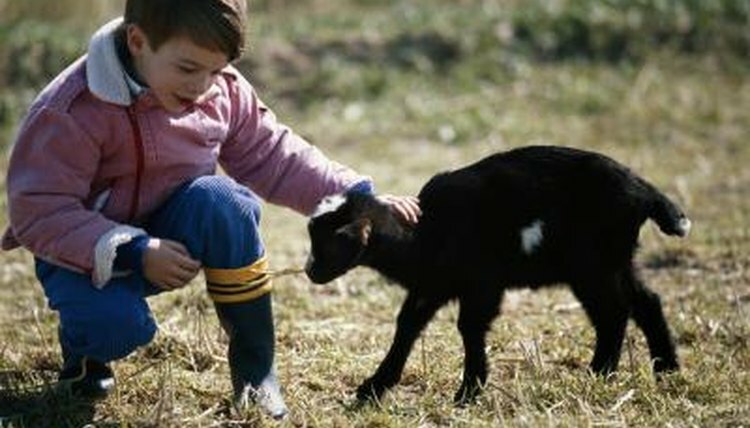 Since goats vary so much in size, the appropriate amount of dewormer for a pygmy goat differs from a full-size animal. If you breed goats, deworm your does right after they give birth, which gives the kids some immunity through the milk. You should also deworm does during their dry periods, when they aren't nursing and their udders aren't full. To reduce the odds of worm eggs contaminating fresh pasture, deworm your goats prior to moving them to a new field. Among the most common worms in goats is the barber pole worm. An infestation causes anemia. Severely afflicted goats develop bottle jaw, or fluid accumulation underneath the jaw. Ask your vet about the appropriate off-label wormer to get rid of these parasites. Stomach worms cause diarrhea. Goats are also subject to lungworm and tapeworm. Ivermectin gets rid of lungworm and stomach worms, while tapeworm succumbs to benzimidazole dewormers.